On April 25-29, Chris Merrill of the U. of Iowa’s International Writing Program and I were in Baghdad, Iraq, attending that city’s Festival of Flowers. We made this trip after receiving a surprise invitation from Baghdad’s first female mayor, Dr. Thikra Alwash, and the Director of Baghdad City of Literature, Sadek Mohammed. I can’t begin to convey what an extraordinary experience this was, but I do want to share some highlights with you. Mayor Alwash has a very difficult job, one that is vastly harder than mine. Her city has been devastated by two invasions, a decade-long trade embargo, and violent internal conflict. But her city has been bouncing back from those traumas and now shows significant signs of recovery. That Dr. Alwash has been appointed mayor might be one of those signs. We could see evidence of devastation almost everywhere we looked: destroyed buildings, roadways bordered by concrete barriers, pervasive security checkpoints, horrendously congested traffic, and streets lined with posters of “martyrs” who have died fighting against ISIS. But Baghdad is also a city in which life and hope survive. This we felt in the warmth and generosity shown to us by Mayor Alwash and her staff, Sadek Mohammed, Sheik Ibrahim Hawash, and many ordinary Baghdadis. We saw it during our guided tour of the Iraq National Museum – officially reopened in 2015 after being looted immediately after the 2003 invasion – and its stunning array of archaeological artifacts extending back 5,000 years. We could almost touch it during our guided walk through dense crowds of ordinary Baghdadis on “Booksellers Street” and other parts of old Baghdad. And we heard it in the voices and tones of the traditional Baghdadi singers and musicians we witnessed in the Baghdad City Museum. Unquestionably for me, the high point of our visit was attending the Festival of Flowers’ opening ceremony in the Garden of Ridvan on the banks of the Tigris River. 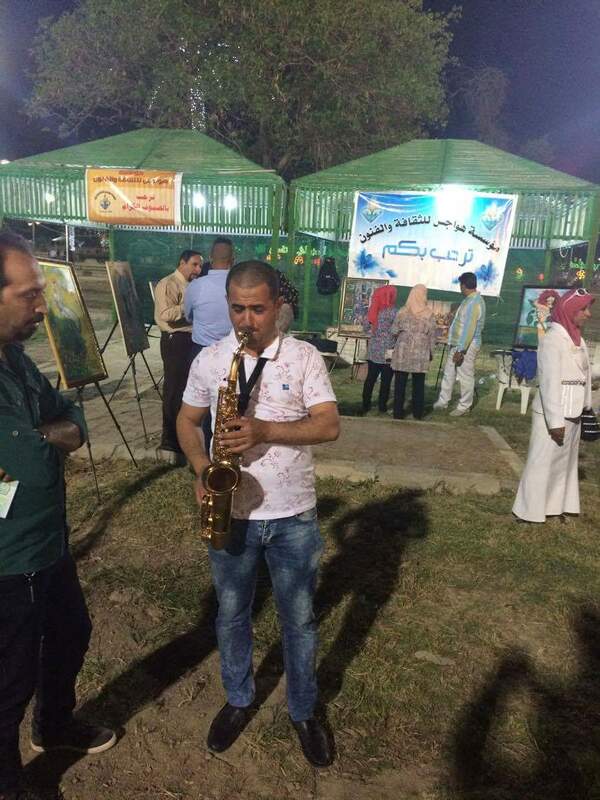 There – surrounded by the wreckage of war – we joined a few thousand Baghdadis (including small children) in walking around, hearing music, seeing fireworks, admiring beautifully designed flower gardens, and visiting an array of booths in which various kinds of handmade art were displayed. At one point during the festival, Sadek introduced us to a young man named Ahmed Raheem Kadhim whose dream is to visit the U. S. and learn how to become a jazz saxophonist. We asked him to play for us, which he did with friends and news media photographing him. You should have seen the joy in his face! I awoke the next morning thinking that, in relation to the surrounding wreckage of war, the festival in the park felt like an earthly paradise. It signaled that recovery was taking place and that Baghdadis were experiencing a rebirth of hope and wonder. But as we were speeding back in an SUV to our tightly guarded Hotel Babylon the following night, and just after Chris Merrill said “We could be driving down any street in the world,” a massive car bomb exploded at the entrance to a police station maybe 500 meters to our left. With ISIS later claiming responsibility for the deaths of 4 and wounding of 8 that it caused, this explosion clearly asserted that Baghdad is not yet free of violent sectarian conflict. Why is Baghdad so damaged? What role have we Americans played in producing and continuing that damage? What should we in America do now? I pondered those questions while in Baghdad, partly because I was just finishing Andrew Bacevich’s 2016 prize-winning book, America’s War for the Greater Middle East. Bacevich reviews America’s military involvement in the Middle East from the early 1970s through 2015. He tells a tale of the U. S.’s effort to, initially, ensure unimpeded access to Persian Gulf oil, and, later, to use our country’s military power to maintain America’s privileged position in the global order. With considerable credibility, Bacevich claims the effort has failed abysmally and future efforts to impose order militarily are unlikely to succeed and might well make things worse. Rather, he argues the War for the Greater Middle East is “a diversion that Americans can ill afford…[W[hether the United States is able to shape the Greater Middle East will matter less than whether it can reshape itself, restoring effectiveness to self-government, providing for sustainable and equitable prosperity, and extracting from a vastly diverse culture something to hold in common of greater moment than shallow digital enthusiasms and the worship of celebrity” (p. 370). For me at least, Bacevich’s message was clear: for Mayor Alwash to succeed in Baghdad, we need to repair our own house. This entry was posted in Baghdad, Newspaper columns and tagged Andrew Bacevich, Baghdad, International Festival of Flowers, Mayor Thikra Alwash, sustainability, UNESCO City of Literature. Bookmark the permalink.